Taxus floridana, as described in 1860 by Nuttall ex Alvan Wentworth Chapman (1809–1899) in Flora of the Southern United States, 436th edition. 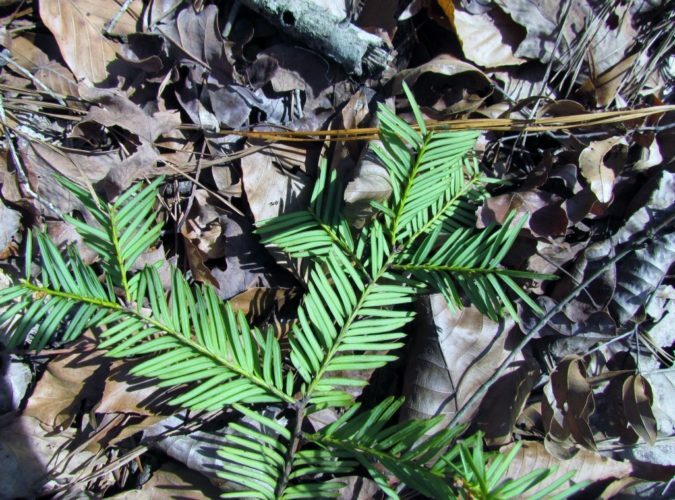 Ii is commonly known as Florida yew. Description. 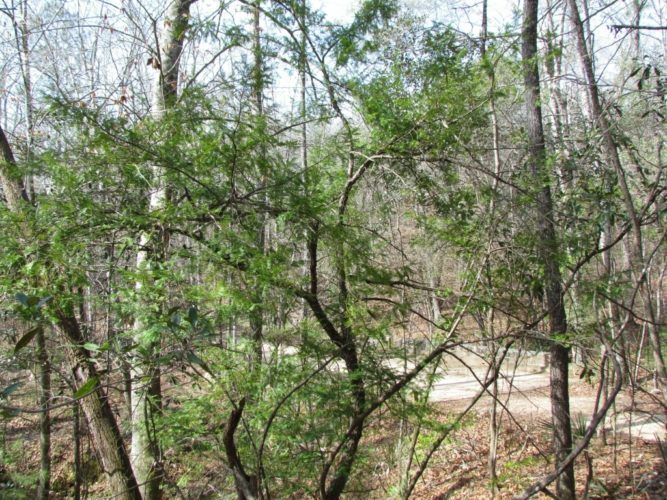 Florida yew is an evergreen coniferous species of tree which will grow to mature heights of 20 feet (6 m) tall, rarely to 30 feet (10 m), with a trunk up to 15 inches (38 cm) in diameter, measured at breast height. It is a dioecious plant, with male and female cones on separate plants. Crown is bushy, open and irregular. 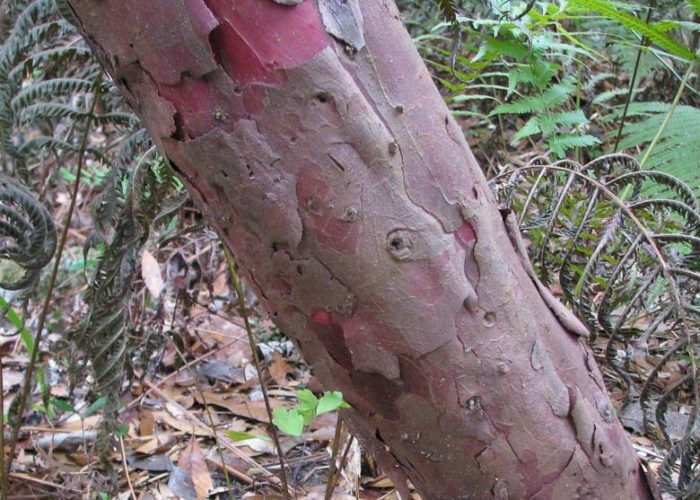 Bark is thin, scaly, and purple-brown in color. Shoots are green at first, becoming brown after three or four years. 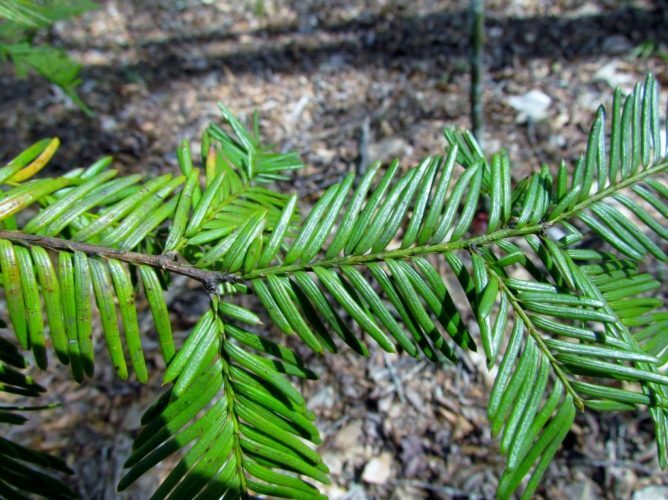 Leaves are thin, flat, slightly falcate (sickle-shaped), and measure 0.4 to 1.2 inches (1 – 2.9 cm) long and 0.04 to 0.08 inch (1 – 2 mm) broad, with a bluntly acute apex. They are arranged spirally on the shoots but twisted at the base to appear in two horizontal ranks on all except for erect lead shoots. Pollen cones are globose, 0.16 inch (4 mm) in diameter, produced on the undersides of the shoots in early spring. Seed cones are highly modified, and berry-like, with a single scale developing into a soft, juicy red aril 0.4 inch (1 cm) in diameter, containing a single dark brown seed 0.2 to 0.24 inch (5 – 6 mm) long. Distribution. This species is found only in a small area of under 6 square miles (10 km²) on the eastern side of the Apalachicola River in northern Florida at elevations of 50 to 100 feet (15 – 30 m) above sea level. It is listed as critically endangered and is protected in reserves at the Torreya State Park and at the Nature Conservancy's Apalachicola Bluffs and Ravines Preserve, and has legal protection under the United States and Florida Endangered Species laws. Ethnobotany. 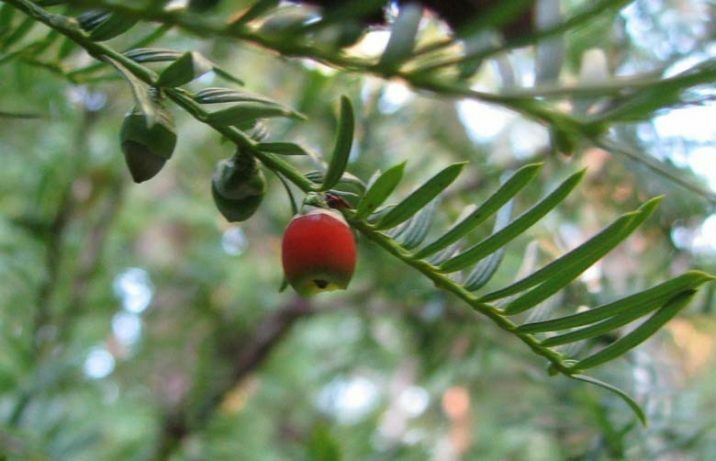 According to Floridata.com, Florida yew contains taxol, the same cancer-treatment compound found in Taxus brevifolia and T. canadensis, and contains it in similar quantities. The rarity of the species has largely precluded economic exploitation for taxol. Attribution from: Matthew H. Hils, Taxaceae. Flora of North America Editorial Committee (editors); Flora of North America North of Mexico, Vol. 2; ©1993, Oxford University Press. Taxus floridana pictured growing in nature at Torrey State Park, Bristol, Florida. Taxus floridana — closeup of bark detail. Taxus floridana— closeup of shoot and seed cone.